As a Datum customer; you will experience the best of what Datum has to offer with each of our products and services. Price is always a significant concern for any business owner. In adding a new shade structure to your business, the budget will inevitably be a major consideration for your decision. When it comes to providing the best prices for our clients, we are proud to say that all our products are priced competitively in the industry. At Datum, we use rust-free aluminum components on our shade structures. We always use quality materials and place a high emphasis on workmanship. When you order a shade structure through Datum, you will receive touch-up paint, AutoCAD production sheets, and shade fabric integration on pre-designed models. Site-specific engineered drawings are available for an additional fee. At Datum, we value your time. For this reason, we provide estimates in less than 24-48 hours on our shade structures. This also applies to custom projects that generally take longer to complete. 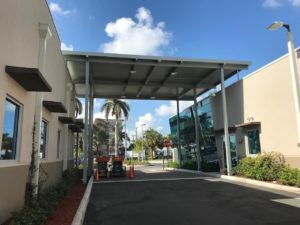 We understand that the needs of your business are your top priority, and want our customers to utilize and enjoy their new shade structures as quickly as possible. As a Datum customer, there is no need to worry about assembling our shade structures. With this, each of our shade structures is shipped pre-assembled, so customers will not need to hassle with a potentially stressful and time-consuming assembly process. In keeping this in mind, we hope to save you time and a major headache that could otherwise come along with a new installation. Since our shade structures arrive fully assembled, your shade structure installation will be quick and easy so that you can get back to business without the added labor.